When his Daddy’s car has problems starting one morning, Matty becomes worried that he won’t be able to collect him from nursery. But Daddy is nothing if not resourceful and is ready to go to any length to ensure he reaches Matty on time. The increasingly outrageous solutions given by the dad keep the tone of this story light and fun while tackling the fear of abandonment that young children regularly have and prompts them to seek reassurance. The artwork oozes fifties retro French chic (the car is a 2CV) , with a beautiful colour palette which is reminiscent of Marc Boutavant’s work. 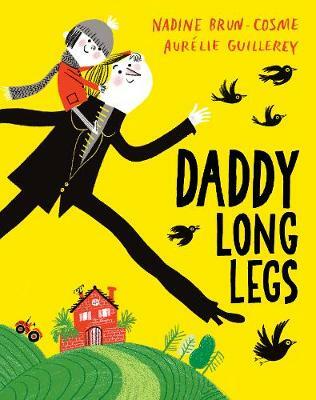 Reassuring yet completely zany, this is a lovely story of a little boy’s relationship with his dad which will make a lovely Father’s Day gift. As summer approaches, many young children will be preparing to start school in September. With this can come lots of jitters and worries, making this a perfect time to read reassuring tales of school life in preparation. 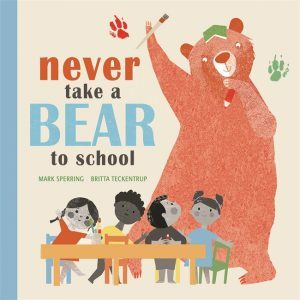 This lovely picturebook is just the ticket; listing the reasons why one’s pet bear cannot come to school, it gently explores expectations at school as well as show all the amazing things that will happen there. The story concludes with reassurance that not everything changes: pet bears will still be there at the end of the day for fun and cuddles. The rhyming text is both fun and soothing and is perfect for reading aloud. Britta Teckentrup’s retro, calming colours and as ever stunning artwork conveys the boy’s emotions perfectly. One of my favourites amongst the many of this genre. There is something so refreshing and slightly cheeky about Nadia Shireen’s sense of humour which makes every new picturebook from her a real treat. Here a little Moon Cow has got lost on Earth and with no one able to understand her, finding a way home is proving to be tricky. The permanent bewildered look of the sheep is enough to crack anyone up, and the array of loveable animal characters is sure to be a winner with readers. The artwork, helped by the layout, is brimming with energy, and will keep the youngest of readers’ eyes glued to the page. 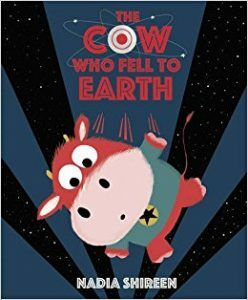 At the heart of this zany intergalactic farmyard tale is a lovely story of home and belonging, and making friends with people that might, at first, look and sound very different from us. This is sure to become a bedtime favourite. The freedoms stated in the Human Rights Act are often taken for granted here, yet never has it been more important in my lifetime to understand those rights and realise how fragile they are, and to make younger generations aware of them. 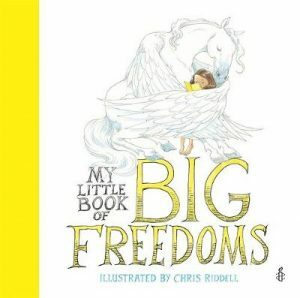 This wonderful little hardback introduces the Human Rights Act in pictures, lyrically illustrated by Chris Riddell and with such simplicity in the textual descriptions of each right that it will be accessible for children from an early age. Rights such as Freedom, Mercy, Belief, Family and Knowledge are included, and animals, and particularly mythical creatures, often seen embracing a child, feature heavily, conveying the sense of protection the Act brings us. Powerful and important, each home should have a copy of this little gift edition.